Let’s Listen and Talk is not a typical distance learning programme. Whilst some of it is web-based and where possible we try to communicate electronically, the detailed support we provide is personal and carefully tailored to your individual family’s needs and those of your child. What are the key features of the programme? 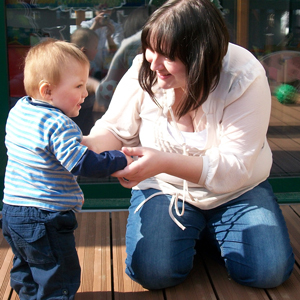 We know from our many years working with children and families at The Elizabeth Foundation that babies and young children learn best from the people they love, feel secure and spend the most time with. Let’s Listen and Talk recognises that families are the best educators of their children. but that these families need expert, friendly advice and support, especially when their children are very young. We know that it’s all about team work – and we are here to help! Bearing this in mind, our Let’s Listen and Talk programme has the following key features. One of our course leaders will provide you with tailored, individual support based on your child’s needs via your choice of telephone, online, email, video and/or Skype. By following the Let’s Listen and Talk online home lesson plans in our courses you will use natural play and daily routines at home to develop your child’s listening skills, their understanding skills (their receptive language) and their spoken communication skills (their expressive language). We have designed the home lesson plans so they use common and easy-to-find toys and household items. They include examples of activities to promote your child’s listening and speaking, and video clips to show how you should carry them out. Much of the content and many of the activities in the lesson plans are based the techniques our Teachers of the Deaf use in our classrooms, and on our successful and long-running print-based Home Learning Programme that has helped many hundreds of deaf children and their families since its launch in 1986. We developed our Home Learning Programme partly by adapting some elements of The John Tracy Clinic’s original correspondence course (with their kind permission). A key part of Let’s Listen and Talk is monitoring and feedback from you. You can report back regularly on what your child is doing, how he or she is responding to the activities in the lessons and any concerns you might have about related issues. Your course leader will closely monitor your child’s progress and provide regular feedback to you. Each family will have an experienced Elizabeth Foundation course leader who will work with them, supporting them through the programme, reviewing their child’s progress and suggesting how to move forward. We have special online discussion forums just for families participating in the Let’s Listen and Talk programme, with contributions and moderation by our expert course leaders. You are welcome to join these online discussion forums so you can share your experiences with other families and support each other. When you enroll on our Let’s Listen and Talk Programme you become a part of The Elizabeth Foundation’s friendly and ever-growing group of families both past and present. We have special online forums just for members of our programme so you can communicate with and support each other. You are also welcome to participate in our events and make use of our extensive resources. We hope you will get involved! But your level of involvement is entirely up to you. 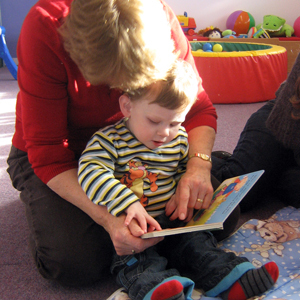 If you visit the course pages you can see sample lessons for each of the Baby, Toddler and Preschool Programmes. The following video also includes examples of the types of activity we will show you how to use in the Let’s Listen and Talk programme. In this video, you can listen to the experiences of the mother of a young boy who has attended The Elizabeth Foundation’s preschool nursery in Portsmouth since he was diagnosed as a baby. She talks about the approach we use at The Elizabeth Foundation and why she thinks her son and their family have benefited from it. Towards the end of the video you will see examples of some of the activities you will learn in the Let’s Listen and Talk programme. We collect on-going feedback about Let’s Listen and Talk from all of the parents who are participating in the programme. We welcome all feedback on the programme and will use it to continuously improve the service we offer to families enrolled on it. We also have a short video you might be interested in watching from parents who know us and who have a little advice they would like to share with other families setting out on this road. If you choose to enroll in the Let’s Listen and Talk programme you will also be able to watch videos of parents discussing their experiences in more detail. You are not alone! Other parents have stood where you are standing now. In this short video, you can hear a poem written by other parents of children with a hearing loss, sharing a little of their experience with the benefit of some hindsight.